The game of roulette is all about predicting the number or color the ball will land on after wheel spinning. Though, luck is hugely involved in the outcome, there are few winning roulette tips and advice out there that are capable of increasing anyone’s chances of winning. This article explains a roulette strategy that works on both real and online casinos. The strategy is easy to learn and involves using the roulette table (I prefer online roulette because I have full control of the table) to arrange the chips to your favor and it doesn’t cost much to execute. Hint: Where possible, always play the European Roulette (with single zero) rather than the American Roulette with double zero because there is higher opportunity of winning using the European Roulette. Stage One – Arrange 5 stacks comprising 4 chips each and bet them in a 6-lines combination. Let’s assume we are to use chips of $1 denomination. Buy a stack of chips worth $20 and break them into 5 different stacks with 4 chips in each of them. Now, you back 5 of the available 6 lines with your 5 stacks of chips. 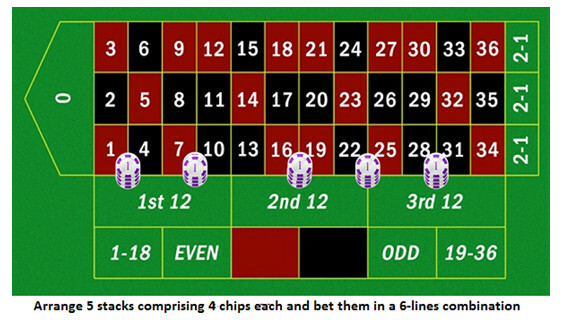 Covering 5 of the available 6 lines gives you higher chance of winning; so if you win, you will win 4 x 5 = 20 chips plus your winning bet (4 chips) giving you total of 24 chips. That’s a good profit to start with, let’s move to next stage. Stage Two – Arrange two stacks comprising 12 chips each and place them on two of the three possible dozens. Here, simply divide your 24 chips into two half so you can have two stacks of 12 chips each. Then, place one in one of the dozens and the other in another of the dozens in order to cover two of the possible three dozens. Now, if the ball falls on either of your covered dozens you will win 2-1 thereby gathering 24 chips plus extra 12 from the winning bet. That gives you a total of 36 chips to chill with. Stage Three – Arrange 6 stacks comprising 6 chips each and place them on 6 different corner bets. With the 36 chips in your hand, share them among 6 stacks with 6 chips in each of the stack. Then, go on and cover 6 corner bets using the 6 chips stack, making sure you spread them out as much as you can and don’t double up on any number in order to cover every possible portion of the table. 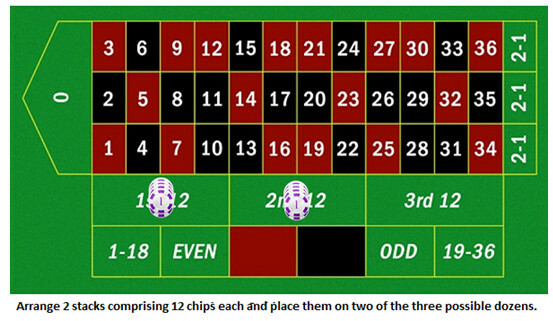 So if you win, you will get 6 x 8 = 48 chips plus your winning bet (12 chips) thereby gathering 54 chips in total. Note – In online roulette, you won’t bet able to start arranging the chips in stacks; you just need to place 6 bets of 6 chips each. Stage Four – Arrange 9 stacks comprising 6 chips each and bet them on 9 different street bets. 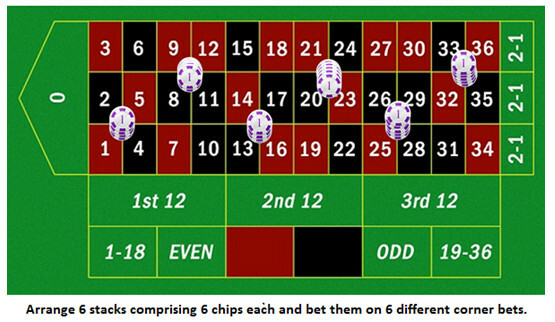 There are 12 possible street bets outcome; place your arranged stacks on any 9 of the possible 12 thereby covering majority of the possible outcomes. 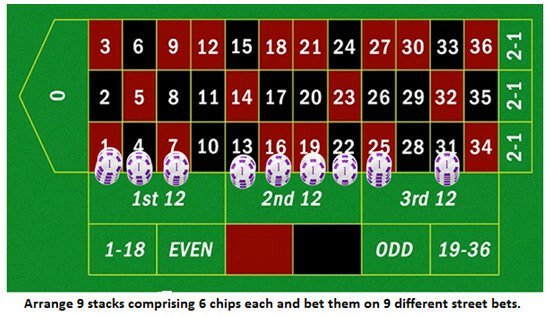 If you win, you will land 6 x 11 = 66 chips plus the other 6 from the winner bet giving you a total of 72 chips. 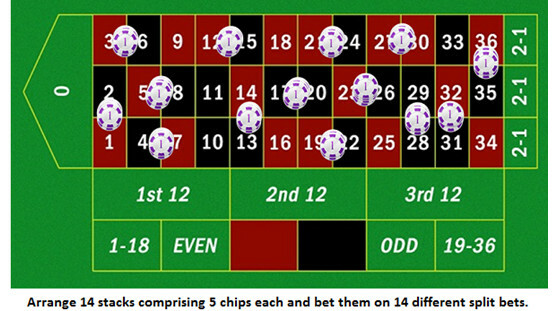 Stage Five – Arrange 14 stacks comprising 5 chips each and stake them on 14 different split bets. With the split bet having 16 possible outcomes, break the 72 chips into 14 different stacks, each housing 5 chips; while two chips will be left over. Now, place the 14 stacks in 14 of the possible bets and then place the remaining two chips in one of the remaining two slots as a kind of insurance cover. If one the split bets land, you will win 5 x 17 = 85 chips plus the other 5 from the winner bet. You now have 90 chips. Stage Six – Arrange 22 stacks comprising 4 chips each and stake them on a straight-up bet. Let’s go for the almighty bet on the Roulette wheel; the straight-up bet. Share the 90 chips among 22 stacks of 4 chips each while two chips will be left over. 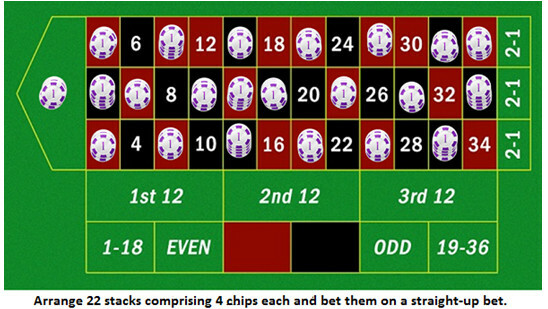 Time to bet; place the 22 stacks on 22 of the possible straight-up bets and then place the remaining two chips on any of the numbers that are empty (one chip per empty number) to be used as insurance cover (in case if the ball decides to fall on either of them) so that you can use the return you get and start the system again. Once you hit a winning number, you will win 4 x 35 = 140 chips plus the 4 chips in the winner bet thereby gathering total of 144 chips. I’m sure racing from $20 to $144 is a good return on investment and worth the risk. 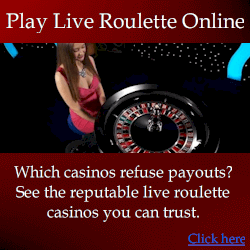 Now that you have a roulette system that works, go on and make money. IMPORTANT! The above article was written by a player who eventually found the strategy failed. With the writer’s permission, I have only published it as an example. It does NOT work, and here’s why . . . Did you notice that the strategy did not even try to predict the winning number?